Guimaras Island—7-Eleven rider Marcelo Felipe reaped dividends when he made a pact with Filipino rival and Philippine Navy-Standard Insurance rider El Joshua Carino as they finished 1-2 in Stage 2 of the Ronda Pilipinas 2019 here. Marvin Tapic of Philippine Army-Bicycology Shop (left) fights for the lead as he joins the first group in the early part of the race in the Stage 3 of the LBC Ronda Pilipinas in Guimaras Island. They agreed to stick together in the last 10 kilometers of the 101.8-kilometer, round-the-island race, giving Felipe and Carino the top two of the stage when they reached the provincial capitol finish line. Both submitted a time of two hours, 40 minutes and 19 seconds following a close fight among many Filipino riders as they kept a tight watch over Spanish rider Francisco Mancebo, who hardly budged from the top of the overall classification leadership. When it was over, Felipe and Carino were ahead of another pursuer, Go For Gold rider Jonel Carcueva, who arrived four seconds behind in third. “Kanina ko pa tinitignan si Carino. Gusto siyang pakawalan ng team niya. Forty seconds lang ang labanan sa team. Pinilit ko siyang dikitin at nag-usap na lang na magtulungan, katulad ni Carcueva na inabot namin,” said Felipe. 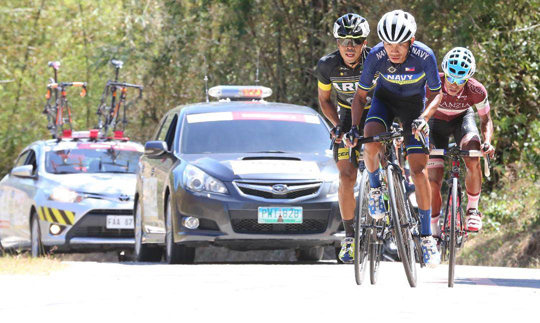 Challenged by strong winds blowing against them in the final moments, Felipe and Carino were in the main group in the last 35 kilometers, allowing Navyman Junrey Navarra and Team Franzia’s Ryan Tugawin move in front. But after a disagreement between Navarra and Tugawin erupted during a sprint stage, the trio of Felipe, Carino and Carcueva vaulted to the front after negotiating a short uphill climb with 10 kilometers left. The chaotic change of positioning among Filipino riders took place in their efforts to check Team Matrix Powertag of Japan and their main bet, Mancebo. The 42-year-old Mancebo, a seven-time Tour de France veteran, stayed with the main peloton all throughout and finished eighth to 52nd place with a 45-man group, 20 seconds behind the leaders. Behind Mancebo in the overall standings were Navyman Junrey Navarra in second, followed by 7-Eleven’s Rustom Lim in third. Defending champion Ronald Oranza and Team Koreil of Korea’s Joo Daeyong were in fourth and fifth, respectively, 14 seconds behind Felipe. Stage 3 will be the second longest race in the five-day bikefest-- a 179.2-kilometer journey from Iloilo City Hall to the Roxas City.